“Shopping” is one of the first interior shopping center ever built. This mid-century gem is hidden away in the cold northern parts of Sweden. Designed and conceptualized by famed British-Swedish architect Ralph Erskine and completed in 1955. After visiting an open-air shopping mall in Canada with harsh weather conditions, Erskine wanted to create a place that would be enjoyable for everyone all year round, not being dependent on the current (and sometimes harsh) weather conditions. The shopping centre was to become a natural meeting point for everyone in the city and to offer both entertainment, dining and plenty of merchandise and goods for all the family. It was nicknamed “a city within the city”. The unique floor plan of the shopping center features multiple levels that are offset to each other by half a level and all connected by numerous staircases and escalators – creating a maze that can be a bit confusing to navigate for first comers (and thus requiring mall hostesses that could guide the visitors). The huge concrete pillars and walkways supporting the construction makes it a look a bit cold but at the same time very clean and easy on the eyes. 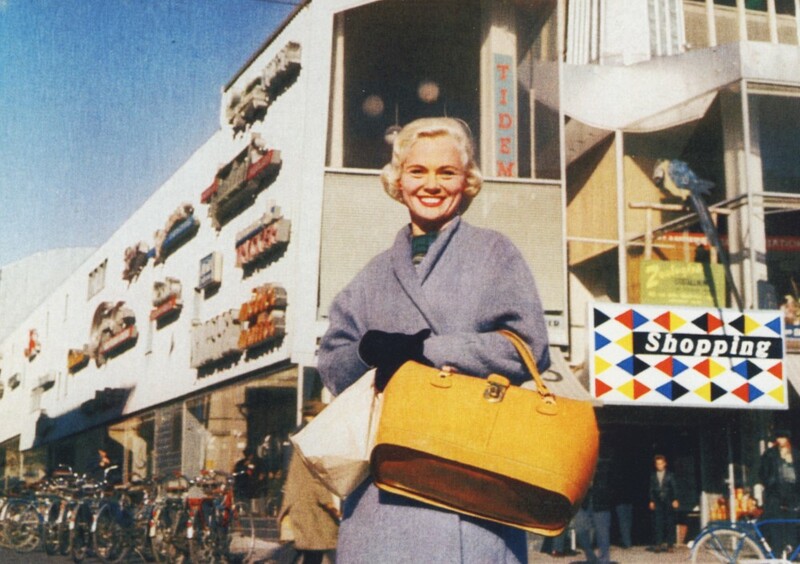 This type of design was very popular throughout the the 50s and 60s, and Sweden was no exception. Shopping also featured a unique cinema within the lower levels. Nicknamed “The Grotto“, it was built to resemble a massive cave with its egg-shaped layout and raw concrete walls. It was however forced to close down in 1988 when a big multiplex cinema opened nearby. The mall is still around today, although with a updated design and the addition of the typical anchor stores found in every mall nowadays. Video that visits the shopping centre when it was first opened (in Swedish only). Above: A diagram showing the original design of the shopping centre. The cinema can be seen in the lower left section.